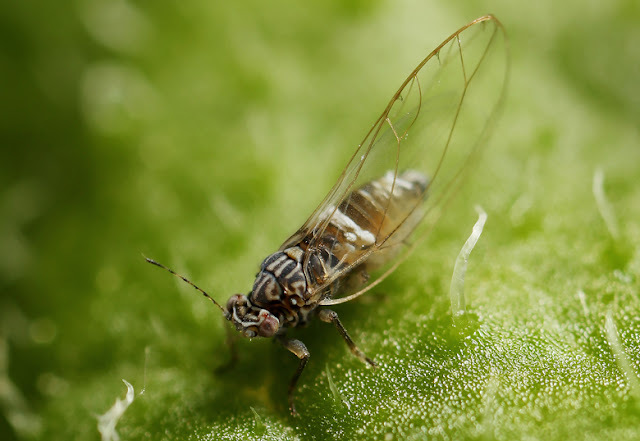 An infected potato psyllid insect carries the Lso (Candidatus Liberibacter solanacearum) pathogen that can cause zebra chip disease in potato crops. Zebra chip has affected potato crops in the United States, Mexico and New Zealand and caused millions of dollars in losses. Potatoes with zebra chip develop unsightly dark lines when fried, making affected potatoes unsellable. DNA testing for Lso was conducted in Dr. Larry Kawchuk’s lab, Agriculture and Agri-Food Canada, Lethbridge, from psyllids found on sampling cards in Johnson’s lab at the U of L. The first detection of Lso came from sampling cards collected at one site south of Highway 3. Johnson and his team subsequently increased the intensity of their sampling. The team will continue to collect samples to determine when and if the number of psyllids with the pathogen decline. Potato psyllids, free of Lso, have been found in at least two greenhouses, where they can infest peppers and tomatoes. Johnson and his colleagues are considering the possibility that psyllids imported on plant material could have transferred Lso to the resident potato psyllid population. While growers and managers can be reassured the numbers of potato psyllids and the incidence of Lso are currently low, Johnson has several recommendations. Monitoring for potato psyllids near the collection sites where Lso was detected should be increased. Additional monitoring techniques, such as nets, vacuums, and examining nearby vegetation, should be undertaken during and after harvest to detect overwintering potato psyllids. Plant samples, including harvested potatoes, should be tested from the sites where Lso was found. Managers should be made aware of the need for monitoring stored potatoes. The monitoring for natural enemies of potato psyllids, such as minute pirate bugs and ladybird beetles, should continue in an effort to determine to what extent they could reduce future potato psyllid numbers. The Canadian monitoring program began in 2013 in cooperation with Scott Meers, an insect management specialist with Alberta Agriculture and Forestry. The research and monitoring network is supported by Alberta Agriculture and Forestry, Agriculture and Agri-Food Canada, Growing Forward 2 (a federal-provincial-territorial partnership), the Canadian Horticultural Council and the Potato Growers of Alberta.